Christina Merritt-Lawrence, Community Life coordinator at Country Meadows of Leader Heights, is honored to be awarded the Most Valuable Employee award by PHCA. Click here to watch a video about Christina. Christina Merritt-Lawrence, Connections Community Life coordinator at Country Meadows of Leader Heights in south York, is honored to be named Personal Care Most Valuable Employee of the year by the Pennsylvania Health Care Association (PHCA). She is among seven of the state’s best healthcare professionals honored as 2018 Hero Award winners for their extraordinary contributions toward the care of the state’s seniors. “Everything she does is geared towards how does this make a difference in a resident’s life, how do I connect with them, how do I make their life better,” adds Joel Kroft, executive director of memory support-Country Meadows. To interact with residents living with memory challenges, Merritt-Lawrence uses a communications technique called the Validation Method. It teaches caregivers how to listen with empathy, and how to ask questions that help persons with memory loss fully express their concerns and frustrations. In fact, she is so dedicated to caring for seniors that she completed coursework to earn her certification as a Validation teacher so she can share the method with others. “I think I make a difference by trying to always interact with compassion and empathy and meet [residents] wherever they are. Some people want to have a buddy to laugh with, and some people want a sense of esteem and respect. Whatever that resident needs, we try and give it to them,” says Merritt-Lawrence. PHCA’s “Hero Award” honors individuals who excel in providing outstanding care in a cooperative spirit of teamwork. 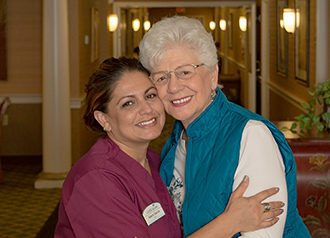 Each year, PHCA accepts nominations from employees and administrators at long-term care and senior service facilities across the state that wants to recognize colleagues for their commitment and dedication to quality care and quality of life.